The MSK system works to give humans the ability to move and provides form, support and stability. This system truly plays a pivotal role in everything that we do! However, our day-to-day decisions, such as deciding to exercise and practice good posture, can have an important impact on the MSK system’s ability to function as it should. One of the key components of a healthy MSK system is movement. In fact, exercise has been shown to have a positive effect on pain perception as well as function in people suffering from chronic pain. Moderate exercise has also been related to the prevention of MSK conditions and related risk factors like obesity. Generally, if one or more elements of our MSK system are dysfunctional, we may be more susceptible to cumulative stress, fatigue, injury and pain. Whether you go to the gym or prefer other activities like yoga, exercise is essential to building and maintaining muscle tone, bone health and joint mobility, among others. Muscle endurance can help to maintain good posture by engaging the back and abdominal musculature that help us to stand tall and engage in various activities like lifting while minimizing the risk of injury. However, when you exercise, pay careful attention to your preparation, form and training (within your own personal limits). Maintaining a neutral spine is highly recommended for most weight training exercises. Talk to your chiropractor to learn more about activities that can help prevent injury and maximize function. Your chiropractor can help work on proper form to meet your athletic or lifestyle goals. Both feet should be parallel and planted on the ground whether standing or sitting. Distribute your weight evenly between the balls of your feet and your heels. Knees should be positioned over the ankles and slightly bent, rather than locked. Keep your hips positioned over your heels. Allow for the natural curve at the small of your back and be careful not to tilt your pelvis forward as this places undue strain on the muscles of your lower back. Stand straight and tall. Your shoulder blades should “melt” down your back and allow for the natural curve of your thoracic or upper spine. Your ears should line up above your shoulders. Don’t lean your head forward to look at your device or computer screen. Adjust your work area so that you are looking straight ahead comfortably. We have written before about posture because that’s how important we think it is! 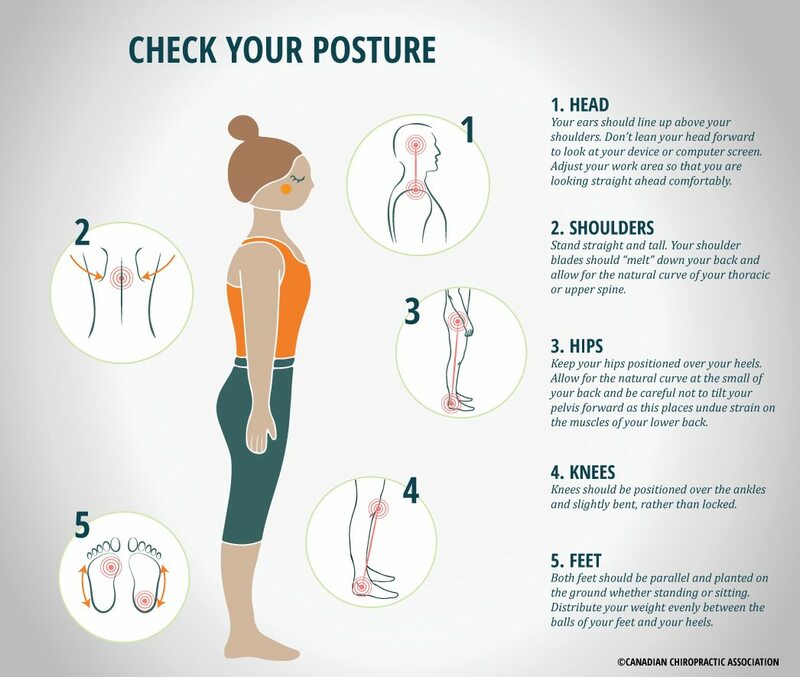 Also, make sure to check out Straighten Up Canada, our free app designed to help you achieve better posture with simple exercises that only take three minutes a day.